The widespread use of autonomous driving is not yet a reality and will require a reliable, robust and extended wireless network. Promising high-speed data rates and very low latencies, 5G is the future of autonomous vehicles. With deployment scheduled from as early as 2020, vehicle communications or V2X communications (Vehicle-to-Everything) will enable vehicles to interact in real time with their environment so as to increase road safety, traffic efficiency, and energy savings. 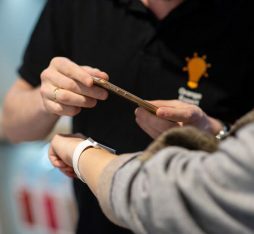 Since 2016, Orange research on connected mobility based on cellular networks has focussed on two research projects: Towards5G, in a private partnership with Ericsson and the PSA Group, then 5GCAR, a collaborative project funded by the European Commission. Three use cases were retained in the 5GCAR project: “Lane merge coordination”, “Cooperative perception” between vehicles, and “Vulnerable road user protection” (i.e. pedestrians, cyclists, etc.). Within the frame of the 5GCAR project, the first cooperative ITS (Intelligent Transport Systems) use cases to use the future 5G cellular technology were defined and are in the process of being validated in France. The roll-out of autonomous driving is not yet a reality and will require a reliable, robust and extended wireless network. Promising high speeds and very low latency, 5G will make a major contribution to the future of autonomous vehicles, supporting their intercommunication. Tests currently underway in France and elsewhere in Europe are helping to demonstrate this prospect. 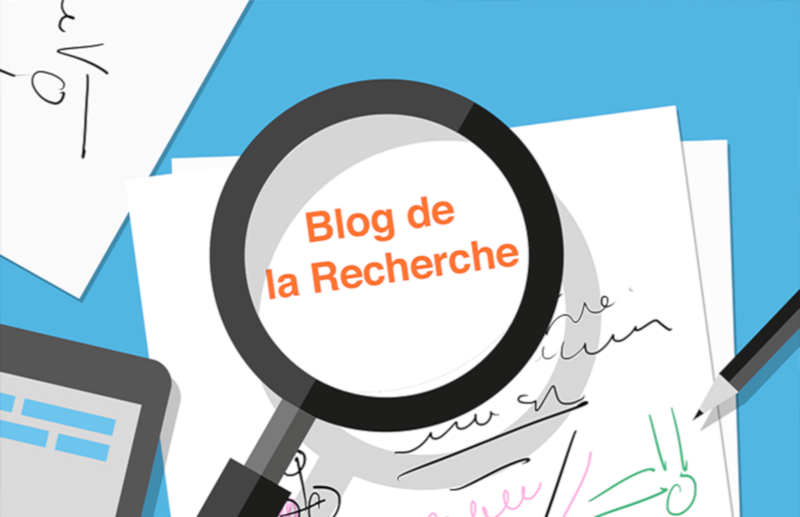 At Orange, studies on connected mobility based on cellular networks began more than ten years ago. These have been furthered by a number of national and European collaborative projects (such as SCORE@F, SCOOP, 5GCAR and 5GCroCo)  and through partnerships with key stakeholders within the field of connected vehicles (such as telecoms equipment and car manufacturers). Such projects have demonstrated and set in motion the possibilities of offering and maintaining better, interruption-free connectivity for connected vehicles (e.g. through Home Agent, mobile routers and DSMIP)  and of vehicles exchanging messages with their environment. In doing so, the projects have also revealed how the mobile networks of tomorrow will enable the provision of safety services for connected vehicles. With deployment planned for 2020, vehicle communication, otherwise known as V2X communication (which stands for Vehicle-to-Everything ), will enable vehicles to communicate with their environments in real time to improve road safety and traffic flows and achieve energy savings. The following diagram illustrates the various forms of communication covered by the term V2X. 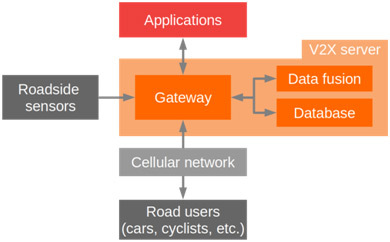 Following on from its interest in the challenges involved with hybridising direct (ITS-G5) and cellular (LTE) vehicle communication systems, in 2016 Orange began to focus its research on 5G in connected vehicles, initially with Towards5G and then 5GCAR. As part of the Towards5G  initiative, in private partnership with Ericsson and PSA, a test network was deployed in France to trial vehicle applications involving V2X cellular communications and to assess the achieved performance. The network is based on an Ericsson evolved LTE core network complete with functionalities prefiguring the future 5G, including network slicing , which can be used to partition network traffic, and local breakout , which drastically reduces latency. A dedicated server was also set up for exchanging location-based messages between vehicles. Vehicles are equipped with mobile routers (On-Board Units, or OBUs), developed by Orange, to connect them to the LTE network and to detect their positions and dynamic parameters using a GNSS module . An in-vehicle tablet with an Orange graphical interface enables information from the mobile router to be visualised and allows testing of the use cases developed during the partnership. Two main use cases illustrate the potential of 5G technology to improve vehicle connectivity through cellular networks: the self-explanatory “Emergency Vehicle Approach Warning”, and the “See Through” use case, which enables drivers to see through a vehicle. The “Emergency Vehicle Approach Warning” aims to warn a driver that an emergency vehicle is approaching even before it is visible to them because it is either too far away or on an adjacent road. To do this, the connected emergency vehicle sends its position to the server through its mobile router, which will indicate whether its emergency lights are activated or not. The server redistributes the message on the emergency vehicle’s position to vehicles in the surrounding area, which then alert their drivers of its position if the emergency lights are activated. Since vehicle position messages are small in size, it is important to have the lowest possible latency when exchanging them. This can be achieved through local breakout. Network slicing ensures that flows between the critical vehicle slice and the multimedia slice are separated. The second use case developed during the Towards5G partnership enables a vehicle driver to see “through” a vehicle in front of them that is obstructing their view, which can help with overtaking, for example. To do this, a vehicle equipped with a high-definition camera connected to the mobile router can transmit the video stream when automatically requested by the mobile router of a vehicle behind. The video stream is then transmitted via the vehicle slice using local breakout, ensuring low latency. The main limitation of the use case in this form is the fact that it uses a great deal of bandwidth. However, the advantage is that it provides an incredibly visual depiction of the vehicle slice performance at low latency while maintaining speed, compared to the mobile broadband slice, which is the first to be affected by any deterioration of radio and network performance. The following video illustrates this use case. Unlike Towards5G, which was a privately funded project, 5GCAR is a collaborative project on a broader scale, funded by the European Commission as part of the 5G Public-Private Partnership (5G-PPP), which brings together about a dozen stakeholders from five European countries, including the three main network equipment manufacturers, Ericsson, Nokia and Huawei Germany; two automotive manufacturers, PSA and Volvo; automotive equipment manufacturers; several research centres, SMEs and universities, and a network operator: Orange. 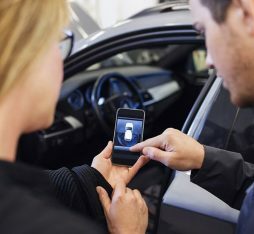 With its wealth of experience gained from Towards5G, Orange’s research contributed to the project by proposing enhancements to mobile routers so that the vehicles of automotive manufacturers can be equipped with them. Orange also contributed to the design of a generic V2X application platform used to exchange messages between vehicles and with various application modules hosted in the network, and serving all the use cases developed during the project. Three use cases were selected as part of the 5GCAR  project: “Lane Merging”, which assists merging into a lane, “Cooperative Perception” between vehicles, and “Vulnerable Road Users’ Protection” for protecting vulnerable road users such as pedestrians and cyclists. “Lane Merging” is used to assist an autonomous connected vehicle in merging onto a dual carriageway or motorway. This is made possible by the “traffic orchestrator”, an application module hosted in the network and connected to the V2X server. It gathers information on the positions and dynamic parameters of vehicles on the motorway and suggests trajectories to vehicles wishing to merge as well as to those located within the merging zone in order to optimise the free flow of traffic and facilitate merging. 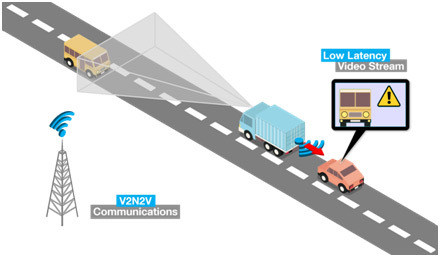 While connected vehicles permanently communicate their position to the V2X server and are therefore taken into account by the orchestrator, non-connected vehicles are detected by smart cameras that are arranged around the merging zone and detect the positions of all vehicles. 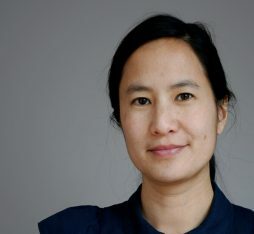 To do this, they use image processing techniques that draw on artificial intelligence . Data from these cameras is then sent to the V2X server, where a data fusion module compares it to data compiled by the connected vehicles in order to avoid duplication. This use case aims to demonstrate the advantages of a cellular solution with low latency in organising road traffic, which would not be possible with a purely direct system such as ITS-G5 . “Cooperative Perception”, the second use case, is separated into two parts. The first is a version of “See Through” V2V that has been improved compared to that developed for Towards5G. It uses an evolved radio system based on 5G technology to transmit high-definition video at faster speeds and even lower latencies. The second part still aims to use an in-vehicle camera, but this time the camera is supported by an image analysis unit that detects vehicles within its field of vision and transmits them as objects to the mobile router. These objects are then sent to the V2X server so that they can be transmitted to connected vehicles in the vicinity. This is another form of cooperative perception, with a longer range and a different way of managing bandwidth, better placed for use by autonomous vehicles and road applications using the data from the V2X server. 5G should enable this type of solution to be scaled up while ensuring low latencies in order to keep the exchanged data relevant and accurate. 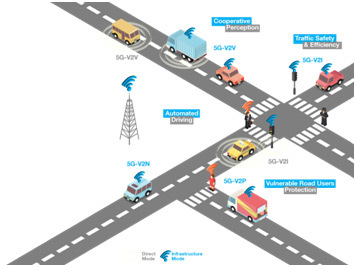 “Vulnerable Road Users’ Protection”, the third use case, employs a solution for detecting vulnerable users through a triangulation system using 5G radio. Pedestrians and cyclists equipped with a 5G terminal are located by the system, converted into objects and sent to the V2X server to be transmitted to vehicles. The device is supplemented by a collision detection module (developed by Nokia) connected to the V2X server. The module collects data from vehicles and vulnerable users and sends them a collision warning through the server in case of danger. For these three use cases, Orange provides mobile routers and graphical interfaces so that they can be presented through demonstrations, and has worked on defining common messages and on the use of a single V2X server. This helps to show the relevance of such an architecture in addressing many use cases. As part of the European collaborative project 5GCAR, the first use cases in cooperative ITS using the future 5G cellular technology have been defined and are currently being validated in France. Going beyond this European project, operators are conducting tests in close collaboration with the automotive industry. This collaboration was established in 2016 with the creation of the 5G Automotive Association (5GAA), which brings together operators (Orange, Deutsche Telekom, AT&T, etc. ), telecommunications equipment manufacturers (Ericsson, Nokia, etc.) and semiconductor manufacturers (Qualcomm, Samsung, etc. ), as well as automotive manufacturers (PSA, Volvo, Volkswagen, etc.) and automotive parts manufacturers (Bosch, Continental, etc.). At the European level, further collaborations among these stakeholders were launched in late 2018 within the project 5GCroCo. 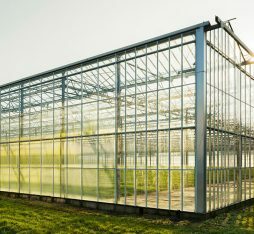 Over an anticipated period of three years, this project will place a strong focus on 5G pre-deployments for cellular V2X and is committed to performing large-scale tests on cooperative, connected and autonomous cars in the 5G European cross-border corridor that connects the cities of Metz (France), Merzig (Germany) and Luxembourg. In this context, three use cases related to CCAM (Cooperative, Connected and Autonomous Mobility) services will be tested: anticipated cooperative collision avoidance, the dynamic generation and distribution of high-definition maps for autonomous driving, and remote driving. 5GCroCo has a total budget of almost €17 million including a contribution by the European Commission of close to €13 million. It brings together 24 partners from 7 European countries. – the mobile router or OBU (On-Board Unit) is an in-vehicle router, and is the client entity of the DSMIP protocol. This router is responsible for providing connectivity and services to the vehicle. It uses all access technologies available to it and is able to switch between them without any network interruptions. – mobile telephony networks. This communication is known as V2N. It is important to note that new acronyms will be continually added as new modes of vehicle communication emerge. For the time being, for example, there is no term for communication between a vehicle and cyclists but it is safe to assume that other acronyms will be added to V2X communications in the near future.